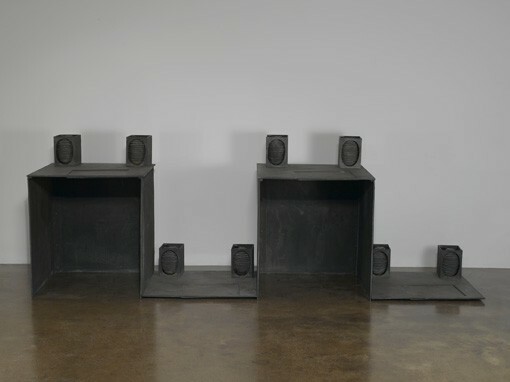 Currently on show at PaceWildenstein, through April 10, is an exhibition of twelve rare Joseph Beuys sculptures. To complement this over 90 black and white Ute Klophaus photographs documenting the several of the artists ‘Aktion’ works will also be on display as well as four films of also documenting happenings in the series. Moreover, a separate screening room is showcasing rare footage and interviews with Beuys. As a whole this exhibition is truly unique particularly considering the infrequency with which these works have been shown; a show of this nature has not been arranged in New York in a number of decades. What is significant about such a show is it tests the limits of how much the audience really thinks they know and have seen of Beuys’s work. For someone so loved in America it exposes how little of the works we have seen in actuality. 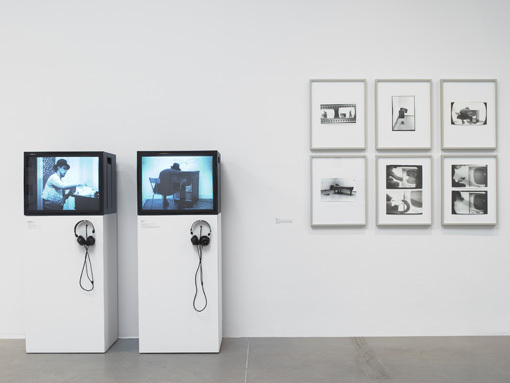 Very physically present works are well balanced by iconic performances that remain only through documentation and finally footage of the artist. One the gallery’s directors in conversation with Vernissage TV said that for him: “you have in America respect without understanding, or without any kind of depth to the experience.” This exhibition attempts to rectify this situation. The main gallery is very well spaced and thus has a rather mellow tempo allowing one to explore each piece individually and in detail. What is more, by applying restrictions to the volume of works the curators have produced an in-depth look at Beuys through specificity. 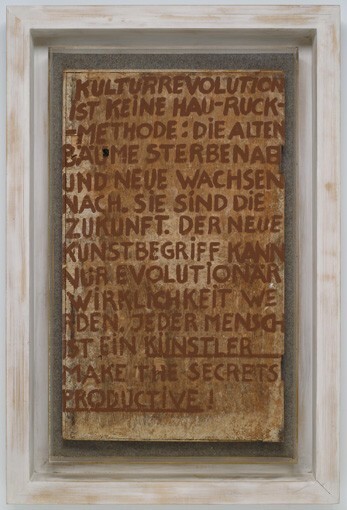 Works include Jeder Mensch ist ein Künstler (Make the Secrets Productive), 1977, text painted onto wood paneling with Braunkreuz, a material Beuys made from hare’s blood and household paint. The curators of the show see this piece as an attempt to indoctrinate its audience with the Beuysian ideology, forever quoted, “every man is an artist;” this piece acts as the lynch pin of the entire show. Other sculptures in the space include Feldbett (1982), OFEN (1983-85), Tisch mit Aggregat (1958-85), Tisch 2 Pole (1959), and Doppelaggregat. Common to all the works is the adoption of base and banal objects and materials in the construction of a unique visual vernacular. The most familiar materials used are certainly felt and fat, together these form part of the Beuys mythology, yet the exhibition on the whole seeks to dispel this instead we become aware of the artist’s sensitivity to materials, which include the organic beeswax, edible chocolate, and elementary copper, iron, bronze, and wood. 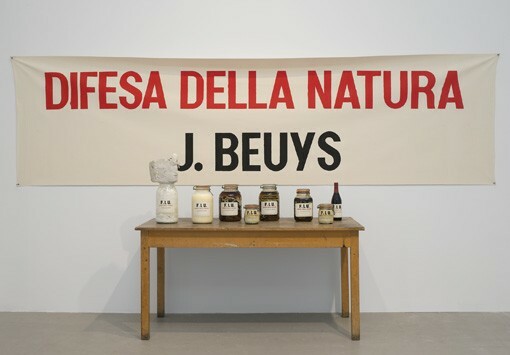 Through repetition of all his substances and objects Beuys creates a powerful, new and almost spiritual symbolism. 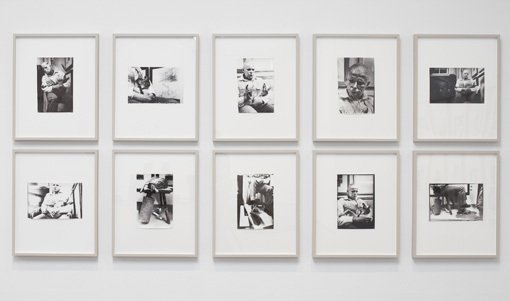 Joseph Beuys, photographs of ‘Aktionen’ by Ute Klophaus. Installation view. 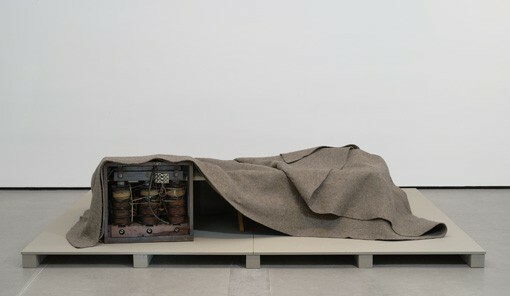 Joseph Beuys, ‘Make the Secrets Productive’, PaceWildenstein. Installation view. 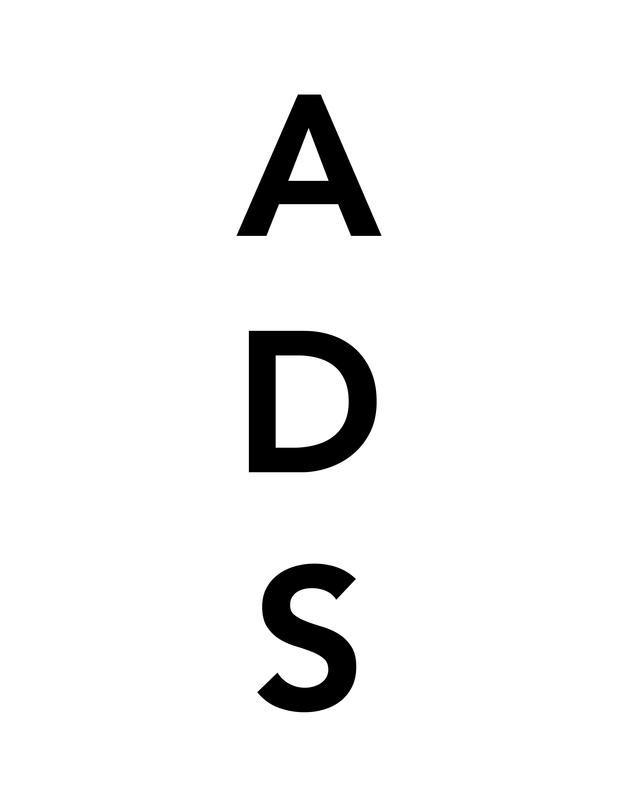 This entry was posted on Tuesday, March 30th, 2010 at 5:13 pm	and is filed under Art News. You can follow any responses to this entry through the RSS 2.0 feed. You can leave a response, or trackback from your own site.